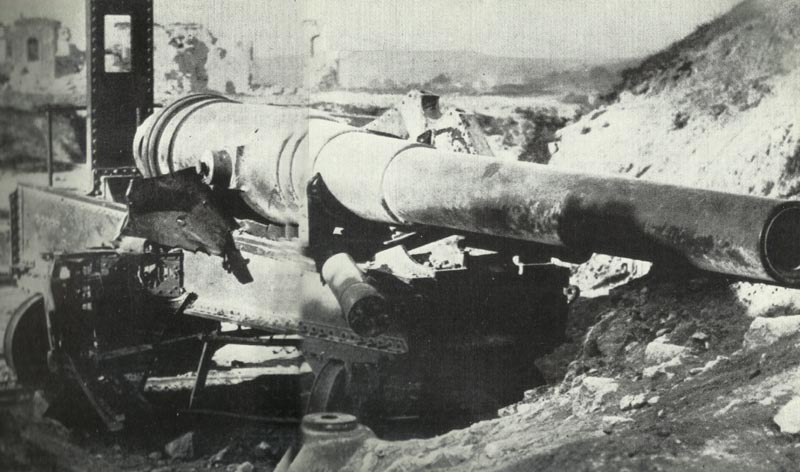 Turkish coastal gun at the Dardanelles, destroyed in the bombardment that day. Dardanelles: FINAL ANGLO-FRENCH NAVAL ATTACK ON DARDANELLES NARROWS BY 16 BATTLESHIPS FAILS, 3 sunk, 3 severely damaged: Irresistible, Ocean and French Bouvet (620 lost, 45 survivors) sunk by parallel mines to shore (laid undetected on night March 8 by Turk minelayer Nusret) in Narrows; battlecruiser Inflexible severely damaged. Suffren severely damaged for 6 weeks. Damaged Gaulois runs aground on Rabbit Island. Allied seaborne breakthrough attempt now abandoned for overland advance on Constantinople. Turk heavy shells almost exhausted (main 48 guns over 6-inch have only 46-230 rounds per gun on March 28). North Sea: HMS Dreadnought rams and sinks homeward-bound U29 (sank Dutch SS Medea off Beachy Head). First U-boat ‘ace’ Weddigen killed. Champagne: Fighting for Jaune Brule Wood. Germany: French raids on Freiberg rail station. Eastern Front­: Russian pilot A A Kazakov, having failed to entangle an Albatros with tracking cable, rams it over Guzov village. Southwest Africa: Botha leaves Swakopmund to lead 21,000 men (13,000 mounted) in 3 columns, captures Jakalswater and Riet Water holes with 284 PoWs and 2 guns on March 20 after night march.